Anri Instruments & Controls is pleased to announce the launch of Neo Monitors AS new Tunable Diode Laser (TDL) model LaserGas 111 Single Path (SP) for Oxygen (O2), its 3rd generation of LaserGas analysers. The oxygen analyser is specifically designed for operation in dangerous areas and the entire device is manufactured into a compact and flameproof enclosures that make it suitable for zone 1 & division 1 applications without any purge. The Neo Lasergas oxygen analyser series uses TDL spectroscopy, a non-contact optical measurement method employing solid state laser sources. The selective laser source scans for a single gas absorption line specific to oxygen, thus eliminating cross interference from other gases. Transmission changes caused by varying dust loadings do not interfere with the measurement and automatic correction for process temperature & pressure variations is included. The LaserGas 111 O2 consists of equally sized transmitter & receiver units that are located on opposite sides of the stack, ducts or reactors. Alignment is made simple by weight, size & design has been reduced even with the flameproof approval. The LaserGas oxygen analyser is fast & reliable & all electronics designed to standard IEC 61508, SIL 2 safety integrity level. 4-20mA or digital outputs are available. The LaserGas 111 O2 is the solution for fast & reliable measurement in corrosive, dusty, sooty, tarry, wet gas mixtures & is able to operate in up to 10bar pressure and in up to 1500ºC temperatures. 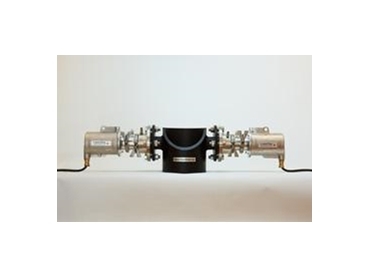 Other gases such as NH3, HCl, HF, H2S, H2O, CO, CO2 , CH4, NO & N2O etc can be monitored by the current LaserGas 11 product line, but will be continuously added to the 3rd generation of LaserGas oxygen analysers.